Hellooooo!!!! Can you believe it's time for another budget post? Oh no? Me neither. I know I say it every month, but this year is just flying by. It's already time for my mid-year budget check-in! I bought a lot this month. Like, go to Nordstrom and return $600 worth of things lot. If I could put in a little embarrassed face emoji here, I would. Really, the problem was that I was trying to find a dress for a wedding we're going to next week and ordering multiple sizes. I ended up deciding to go with Rent the Runway instead because I had some credits (I'm trying this and this), but I suppose that's neither here nor there. LOFT Eyelet One Shoulder Top - originally $39.99, on sale $23.99. I haven't managed to share this yet, but I freaking love it. The main part of the shirt is tee shirt material, which means it's really comfortable and easy to wear. It runs a little big so size down. LOFT Pom Pom Shift Dress - originally $89.50, on sale $44.93. I'm really glad I bit the bullet on this final sale dress, I've already worn it a couple of times including here. The shift shape is really flattering, and the cut makes it appropriate for work while the pom poms add some fun. I keep seeing sizes popping in and out of stock so keep checking if you want it. Fits TTS. J. Crew Factory One Shoulder Dress (back in stock!) - originally $79.95, on sale $39.50. I love love looooove this dress. 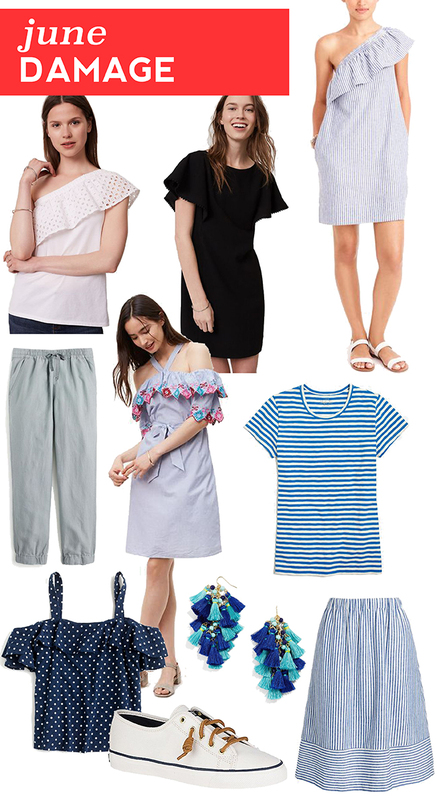 One shoulder plus as ruffle plus a shift shape plus stripes plus blue and white? It's like whoever designed this was reading my mind. The fit is a little large but I still went with my regular size (see it here). This sold out basically instantly so snag it now if it's on your wishlist! J. Crew Seaside Pants - originally $89.50, on sale $52.50. I would not say these are the most flattering pants, they're a little high waisted so I tend to roll the waistband (like those good old Soffe shorts!) but I love them for traveling or for work from home days. They are super comfortable but look way more pulled together than sweats. I got a tall and they're the perfect ankle length. I can see dressing them up but haven't tried it. My only regret is that I got them in gray, and I keep realizing that all of the sweaters I usually travel with are gray too. LOFT Fiesta Dress (currently 50% off!) - originally $89.50, on sale + used rewards $24.75. This dress is just so freaking fun. I love the embroidery on the sleeves and the bow in the back. It's belted but the belt is removable, so it can be pulled in at the waist or worn like the one shoulder dress. It fits large, I sized down to a medium. J. Crew Factory Striped Studio Tee - originally $29.50, on sale $14.50. These tees are the best, I have them in a couple of colors and they're perfect for everyday wear. Unlike a lot of tees on the market these days, they're made from a really thick material that isn't see-through. Definitely size up in them though because they tend to shrink a little. J. Crew Polka Dot Cold Shoulder Top - originally $68, on sale $40.80. This one I'm still not sure about, I still might return it. The polka dots are adorable and I really love the sleeves, but I'm still concerned that the shoulder straps will never stay up. I guess I need to wear it around the house and make up my mind. Sperry Seacoast Sneaker - originally $59.95, on sale $49.95. I just wore these for the first time for my trip to Knoxville, and I'm a bit "meh" about them. On the one hand, they're so cute. On the other hand, I wanted to rip them off of my feet after wearing them for a full day because the elastic band on the top of your foot really starts to dig in. I did wear them again for a shorter time and not have any issues, so it's possible I just need to break them in a little more. BaubleBar Rosalita Tassel Earrings - originally $38, used rewards $32. These were one of those purchases where I saw them and had to buy them immediately. I've worn them a couple of times and it is insane how many compliments I got. They are big but still fairly lightweight because the main material is embroidery floss. J. Crew Factory Striped Cotton-Linen Skirt - originally $69.50, on sale $34.50. I wore this for the first time on Tuesday, and realized that it's made of the exact same material as the one shoulder dress I love so much. So cute with a tucked-in tee and long enough for work, runs TTS. So I'm actually on track for my monthly spend of $300 from the last few years, versus $350 for this year - I guess I didn't need to give myself that raise! Did you budget for June? How did you do?